Krishna Janmashtami, the birthday of Krishna, an incarnation of Vishnu, considered to be one of the supreme manifestations of Divinity in the Indian belief systems, is widely celebrated all over India. Krishna is the subject of much of the Classical Music repertoire in the Indian tradition and there is a plethora of poetry in almost all Indian languages celebrating the childhood of Krishna. There are several temples all over the Indian subcontinent dedicated to Krishna. Guruvayur, in Kerala enshrines Krishna - Guruvayurappan, an image of Krishna from Dwaraka said to have been installed by Guru and Vayu when the great deluge engulfed the earth. Udupi in Karnataka, another of the foremost shrines dedicated to Krishna, houses an image of the young Krishna. 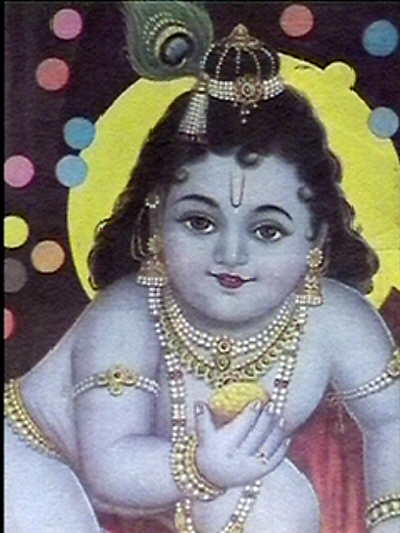 Nathdwara in Rajasthan enshrines Srinath - Krishna, an image that is believed to have been brought from Mathura. Mathura, Vrindavan and Dwarka are temple towns and hoary pilgrimage sites in India associated with the life of Krishna. The Jagannath Temple at Puri, Orissa is a towering monument steeped in worship traditions associated with the state of Orissa. The Southernmost of these, The Rajagopala temple at Mannargudi near Thanjavur, enshrines Santanagopalakrishna and is the largest and grandest of all of the temples listed here. Please visit the Templenet homepage of the Rajagopala Temple for more information on this magnificient temple. Templenet is proud to bring you links to sites related to each of these temples on the occasion of Krishna Janmashtami - 1999.